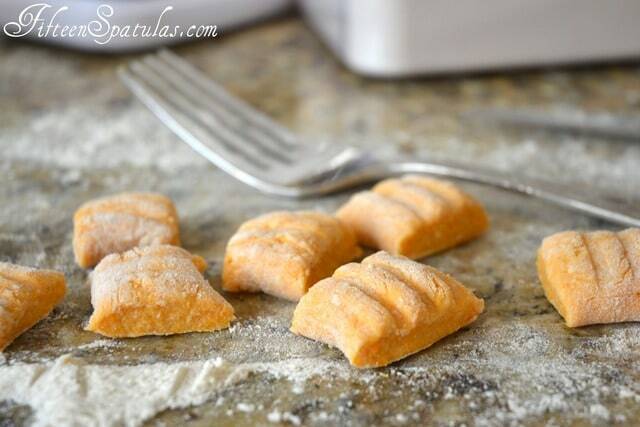 This homemade Sweet Potato Gnocchi is paired with a simple thyme butter for a delicious and comforting meal! If you like classic gnocchi, you might find you’ll be an even bigger fan of sweet potato gnocchi because the flavor is a bit more pronounced. I definitely find that I prefer using sweet potatoes rather than regular for my gnocchi, and the gorgeous color doesn’t hurt either. They’re great enough on their own that you don’t need a fancy sauce for them. Here I brown them in some thyme steeped brown butter right before serving to enhance the flavor. Simple and delicious. Sage would work nicely here too! 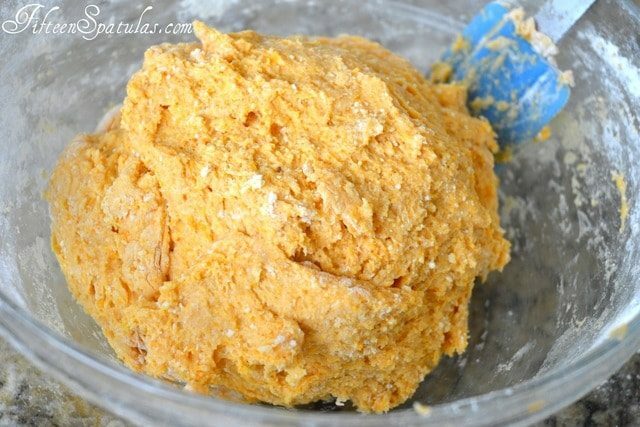 Mix mashed sweet potatoes with ricotta, brown sugar, and nutmeg until blended. Resist the urge to add more flour, as this will make the gnocchi much more dense. Dust your countertop with flour, then take 1/4 of the dough at a time and roll it out into a long rope. Cut 1 inch pieces from the dough. If desired, roll the gnocchi into the tines of a fork to create ridges. The purpose of this is to help the gnocchi catch the sauce with its ridges, but it’s not required here. Boil the gnocchi for 3 minutes until the pieces float, then drain and pan fry in brown butter. Sweet Potato Cheesecake is another of my favorite dishes for a sweet potato themed dessert. Enjoy! 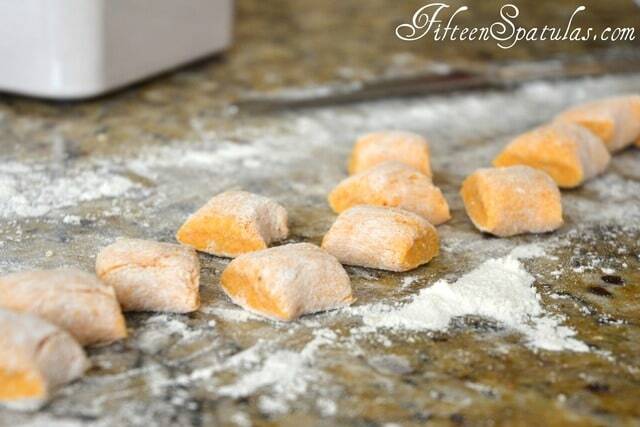 Homemade sweet potato and ricotta gnocchi is paired with a simple thyme butter for a delicious and comforting meal! 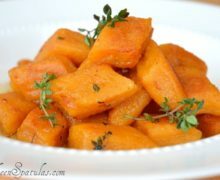 Prick the sweet potatoes all over with a fork, then microwave on high for 7-10 minutes until fork tender. 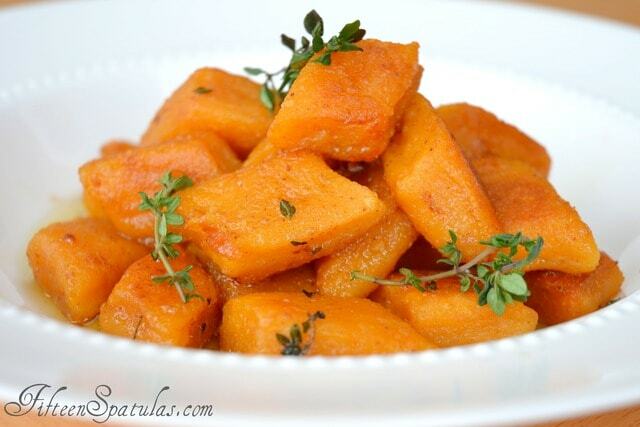 Cut the sweet potatoes in half and let them cool, then scoop out all the flesh. Put the sweet potato flesh through a food mill (this is preferred so you get a fine consistency), or mash it well with a fork. Mix the mashed sweet potatoes with the ricotta, brown sugar, and nutmeg until blended. Season to taste with salt. Add the flour 1/2 cup at at time, until you end up with a sticky soft dough. 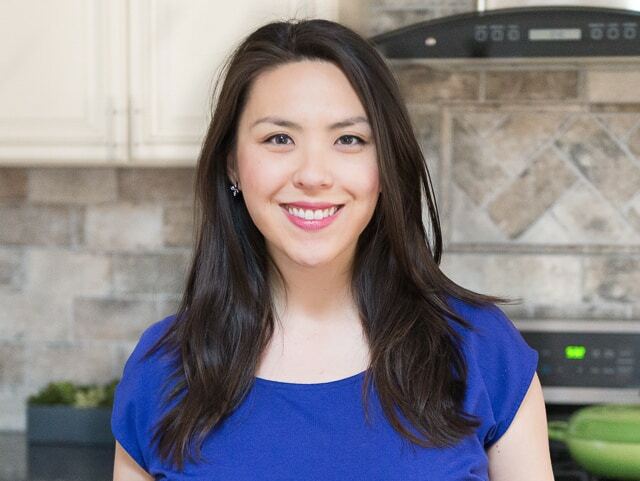 Dust your countertop with flour, then take 1/4 of the dough at a time and roll it out into a long rope. Cut 1 inch pieces from the dough. If desired, roll the gnocchi into the tines of a fork to create ridges. The purpose of this is to help the gnocchi catch the sauce with its ridges, but it’s not required here. Bring a pot of salted water to a boil, and cook the gnocchi (you may need to do this in 2 or 3 batches) for about 3 minutes, until they float in the water. Drain and set aside while you prepare the sauce. Place the butter and thyme in a frying pan and cook over medium high heat until melted. Remove the thyme sprigs if desired, then add the gnocchi to the pan. Fry for about 3 minutes on each side until golden brown, and sprinkle the walnuts on top. Enjoy! Oh wow! Now this one is for me…so delicious! You really made an exceptional dish here.